I live a few hundred yards from Oakland Estuary. It’s a working waterway, with everything from sea-going barges, floating construction cranes, and US Coast Guard cutters; through tugs and large recreational craft; to small one-person sculls and kayaks. 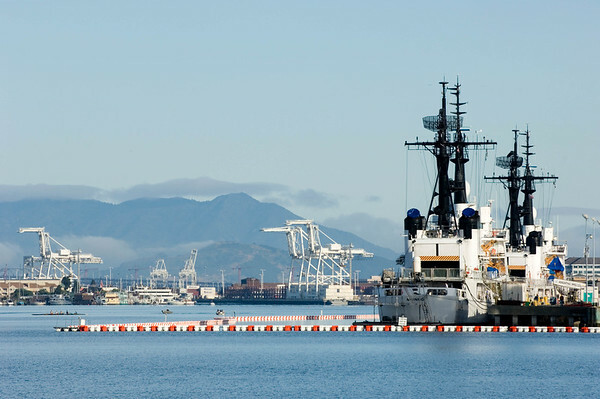 If you include the Port of Oakland (as I do, since the Port’s at the head of the Estuary), it’s also one of the busiest container terminals in America. These images were taken over the past fifteen years or so either on or next to the Estuary. The Port of Oakland from Union Point, Oakland.